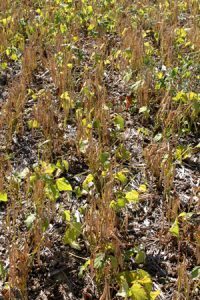 Dry beans have always had the reputation of being one of the more labour intensive field crops. However, dry bean prices are significantly higher than its cousin the soybean and dry bean production can be a very attractive option. With the present high cost of labour, farmers are seriously considering mechanical harvesting. Dry beans generally are difficult to harvest by combine due to the nature of plant architecture. The plants tend to lodge and the pods are too close to the ground. 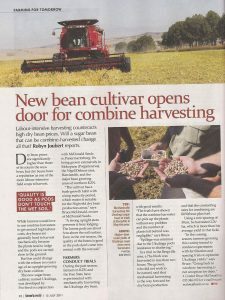 With the release two years ago of a new upright dry bean cultivar, farmers presently have an exciting opportunity to use their combine harvester for dry beans. This new sugar bean cultivar, named Ukulinga, was developed by Pro-Seed in conjunction with McDonald Seeds in Pietermaritzburg. The cultivar has a bush growth habit, but with a long maturity period, which makes it suitable for the Highveld dry bean production areas. The plant has a strong upright stem which prevents it from lodging. The lowest pods are approximately 5 cm above the soil surface. Even in a wet season the quality of the beans are good as there is no contact of the pods with the wet soil. 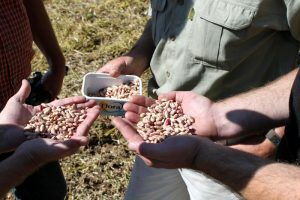 During the past season several farmers in KwaZulu- Natal and the Free State have experimented with mechanical harvesting of the Ukulinga dry bean and with very good results. 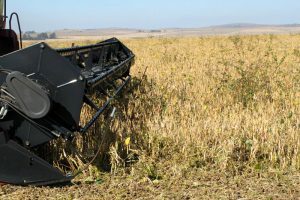 The experiments have shown that the combine harvesters can pick up the plants without a problem and the number of plants left behind was negligible. Spillage was minimal due to the shattering resistance of the Ukulinga bean. 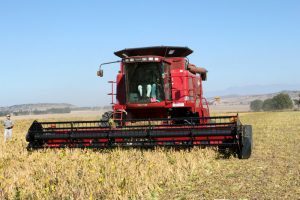 In an experiment in the Bergville area a seven Ha block was harvested in less than two hours. According to the growers mechanical harvesting is the way forward for dry bean production in South Africa. In the coming season they intend to conduct further experiments with fertilization and spacing trials in order to optimize yields of Ukulinga. However, going back to windrow harvesting is not an option for them.